This past weekend did a first birthday cake for my vet's daughter, affectionately known as Gigi (isn't that cute?). They were doing a Hawaiian Luau theme, and wanted to use bright tropical colors. Since it was a holiday weekend and I had no weddings, it gave me a little extra time to throw some creativity at it. I got out my Cricut Cake and my Life is a Beach cartridge and started cutting tropical leaves, tiki heads, hula girls, and tropical flowers. Now these cut files weren't specifically designed for cake usage but they worked very well. 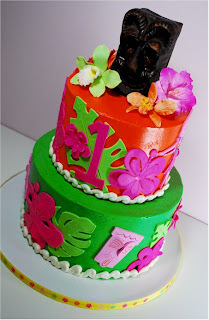 I could pull out the centers of the flowers and the tiki heads and it gave the cake lots of dimension. I even made a big 3D Tiki head out of rice crispy treats for the top. Gigi's Mom was super excited when she came to pick it up, she even shed a tear or two she was so happy! Awwwww! Happy Birthday Gigi!! That is friggin sweet! I love it and I must have the Cartridge now!!! sooo pretty! I love the bright colors! Vertical Stripes are SO Slimming!